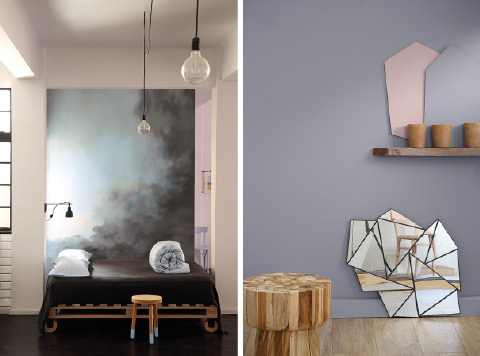 The ELEMENT colour forecast finds beauty in the basics, with soft neutrals, raw surfaces and tonal colour. These are to represent our dynamic relationship with the ever-changing landscape and raw beauty of our world. This contrast of rough and smooth, raw and crafted is well-suited for contemporary homes and offices. Our planet has an indescribable beauty that is magnified by the fact that out there, there is probably not another one like it. The cragginess and anti-uniformity of nature informs the rough and natural design elements of this colour forecast. Free-flowing painting techniques recreate our mountains, rivers and valleys. Different atmospheres can be achieved with the warm shades and grey tones of the ELEMENT colour forecast. Mimic rock and stone with chalky tones applied in subtle layers to create a sense of calm transparency.